Most men don’t spend a lot of time getting manicures, yet the well groomed men want to keep their nails looking neat and tidy which makes a good manicure set an ideal gift for any man in your life. So, here is a look at some of the best manicure sets for men that are currently available. The Seki Edge Craftsman Grooming Kit is a nice functioning and attractive grooming kit made by a world class Japanese manufacturer. 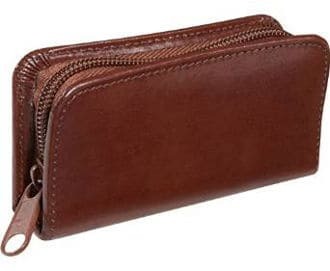 It comes in a genuine leather case with 6 grooming tools including toe nail clippers, nail file, fingernail clippers, nose scissors, stainless steel toe nail clippers and tweezers. This grooming set is quite expensive, but users feel it is worth the price since it is likely to last you forever. Each tool in this set is extremely high quality, sharp and durable. People really like this kit and think it is perfect for both home use as well as traveling. Considering its price, most users feel that you need to care for it and ensure that it does not get lost as it is not cheap to replace. However, they do believe that it is the best grooming kit they have ever had. If you are looking for a basic manicure set that is good for both home use and travel, then the Royce Leather Aristo mini-manicure set makes for the ideal gift. This set measures 4 1/2” X 2 1/4” X 1” and comes in 4 great colors including black, Chestnut brown and British tan. It also contains 4 stainless steel sharp pieces and a zippered bonded leather case which has a small size. The tools in the set include scissors, nail clippers, knife and covered nail files. Each of these hold very securely in place with elastic bands. 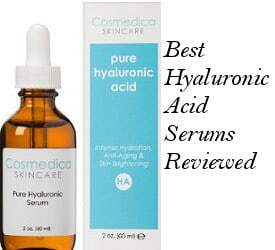 Users like the fact that this is an excellent quality set that is compact and great for travel. Its small size comes in handy allowing for it to be carried on a daily basis for those nail grooming emergencies. They also find that this kit is sturdy especially considering the price. The FOONEE Travel & Grooming Kit comes in a nice looking faux leather case that makes it suitable for travel or home use. 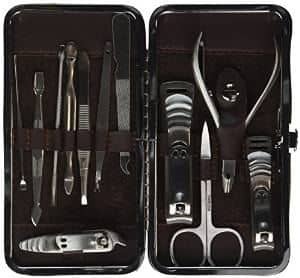 The set is made up of 12 pieces including nail scissors, finger nail clippers, cuticle pusher, nail file, tweezers, nail cleaner, toe nail clippers, cuticle trimmers, lancet, blackhead removal tool and ear wax pick. While this set is nice looking and durable, not all the tools in it are of equal quality. For example, the tweezers are functional, but not the best tweezers that can be found. However, the clippers are sharp, the nail file works well and so does the blackhead remover although it may be a bit scary to use for first time users. The set does contain all of the tools the well groomed man would need in his manicure set as well as a few unexpected but functional extras. While this is not the smallest manicure set out there, it is small enough to easily pack for traveling or keep in your office drawer or glove compartment of your car. Its price is also extremely affordable and all in all, it looks like a nice and very cheap manicure set. 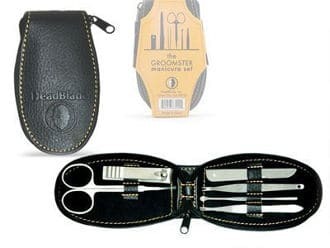 The HeadBlade Groomster Manicure set is a well made and solid manicure kit that contains 6 tools including clippers, file, scissors, tweezers, cuticle tool, and ear cleaner which all fit in an attractive small zipper case that fits in the palm of most men’s hand. Each separate tool has its own holder which helps to keep each piece in great shape and the case is made of some embossed leather like material. 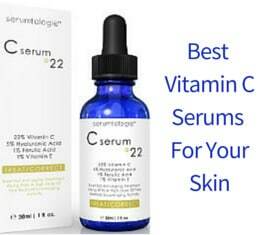 Users really like this product and state that it is a great for traveling. Most think that the tools are good quality finding several things they like about them. 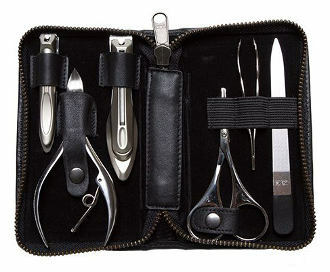 One of the most useful features of this men’s manicure set is that the handles of the scissors contained in the kit have larger holes, making it easy for manly fingers. Overall, it seems that this set holds up well. However, some users feel that these tools are too dull for clipping nails or cutting. 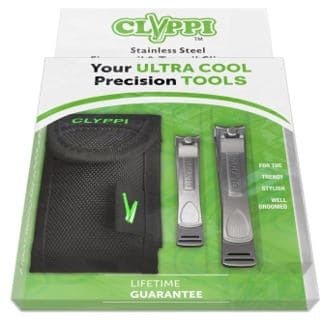 For those men who are looking for just a good set of nail clippers for fingers and toes, the Clyppi nail clipper set looks like a very good choice. It consists of two clippers, a pair of fingernail clippers, a pair of toe nail clippers and a small case to hold both sets of clippers. Both clippers are ergonomically designed and made of high quality stainless steel. 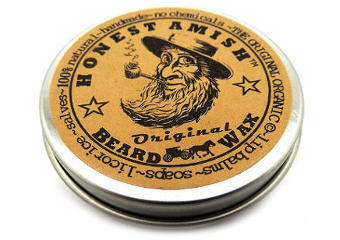 Users say that they cut and shape well without leaving any sharp edges. They are extremely easy to use, durable and long lasting. Manicure sets make great gifts for men of all ages and are useful for helping them keep well groomed and with great looking nails. So, if a manicure set is a gift you are thinking to offer, the above fine sets will give you a good idea of some of the best options available. What Is The Best Safety Razor?